We extend a special welcome to those who are single, married, divorced, gay, filthy rich, dirt poor, yo no habla Ingles. It’s easy to poke fun at some of the things churches say on their welcome sign. It’s easy to question some of the things that make it inside a church bulletin. It’s easy to say “this is bad,” but it’s a lot harder to say “this is good.” Anyone can critique, but creating is a lot more difficult. So what does a great welcome message look like? What does an awesome welcome message look like? It looks exactly like what “Our Lady of Lourdes Catholic Community” has in their church. “We extend a special welcome to those who are single, married, divorced, gay, filthy rich, dirt poor, y no habla Ingles. We extend a special welcome to those who are crying new-borns, skinny as a rail or could afford to lose a few pounds. 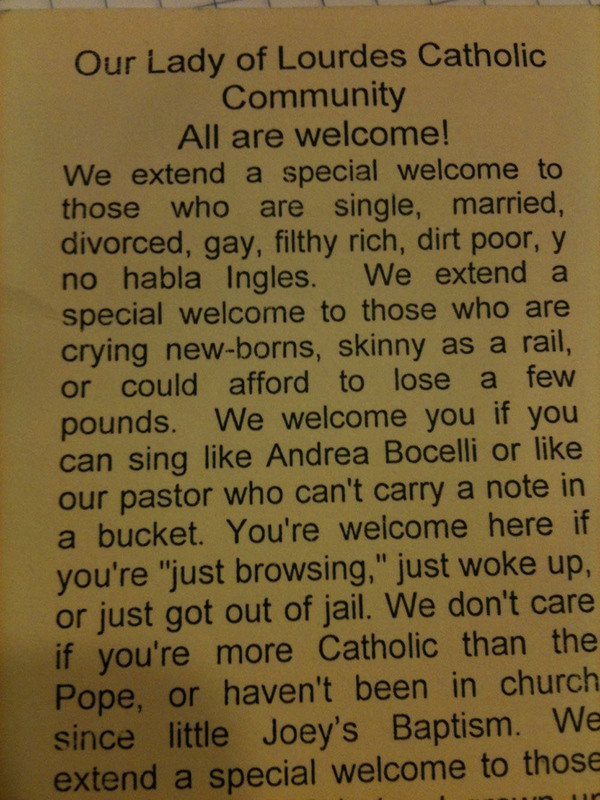 “We welcome you if you can sing like Andrea Bocelli or like our pastor who can’t carry a note in a bucket. You’re welcome here if you’re “just browsing,” just woke up or just got out of jail. We don’t care if you’re more Catholic than the Pope, or haven’t been in church since little Joey’s Baptism. “We extend a special welcome to those who are over 60 but not grown up yet, and to teenagers who are growing up too fast. We welcome soccer moms, NASCAR dads, starving artists, tree-huggers, latte-sippers, vegetarians, junk-food eaters. We welcome those who are in recovery or still addicted. We welcome you if you’re having problems or you’re down in the dumps or if you don’t like “organized religion,” we’ve been there too. Bravo to Our Lady of Lourdes Catholic Community! That should be made into a poster and hung in church offices around the world. I love the thought that a few members of Our Lady of Lourdes Catholic Community getting together and saying, “Let’s invite everyone to come meet Jesus!” And then they started writing their list. And it got long. Why? Everyone changes when they meet Jesus. And they wanted to make sure everyone knew they were invited to meet him. This article first appeared on Jon Acuff’s blog on July 25, 2012. Jon Acuff used to be a Serial Quitter. He had eight jobs in eight years, constantly hoping the next one would be different. From writing advertising for The Home Depot to branding for companies like Bose and Staples, he’s no stranger to the cubicle. In 2010, Jon closed the gap between his day job and his dream job when he joined the Dave Ramsey team to become a full-time author. He has contributed to CNN.com, speaks nationally on a variety of subjects, and is the author of three books: Quitter; Gazelles, Baby Steps And 37 Other Things Dave Ramsey Taught Me About Debt; and Stuff Christians Like. He lives in Nashville, Tennessee, with his wife and two daughters.